We’d love your help. 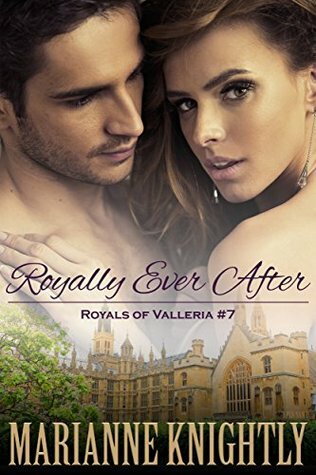 Let us know what’s wrong with this preview of Royally Ever After by Marianne Knightly. Alex and Rebecca have already faced some difficult situations over the past year on their way to the a RSVP for your front-row seat to the royal wedding of the century! Alex and Rebecca have already faced some difficult situations over the past year on their way to the aisle, and now they’ll face their toughest challenges yet. An unexpected medical crisis with two members of the family questions whether the wedding should be delayed, while an ancient law questions their right to get married at all. As if that weren’t enough, visiting royal relatives wreak havoc in the palace, while a menacing voice from the past arises once more, threatening all they hold dear. To ask other readers questions about Royally Ever After, please sign up. A perfect conclusion to an amazing series. I loved reading about the Royal Wedding. It made me think back to the wedding of the royals in England. I have a fascination with reading and watching anything that has to deal with royalty. Twists and turns, but the best thing is that Rebecca handles them and her prince when she needs to. The di Valleria Princes are their usually delightfully profane selves. I was surptised that Ethan the doctor and the baby of the family (his mother adores him) is as take charge as his older brothers. He is one to watch. I have really enjoyed this series and am looking forward to Lorenzo's story (we get some of the details in this book) coming up later this fal. Super good read. A wedding with the trials and tribulations of the most passionate people. Dramatic twists and turns. Funny commentary from just about everyone. But the hear of the book is about love and family. I absolutely adore this series and the royal family. The wedding has finally arrived. Seems like it took so long to get to this point. As usual here in this story as in the real world politics has a major role to play in disrupting anything it can. Alex & Rebecca are up to the challenges. I am in love with this series. Alex is the hero every girl wants. Rebecca has grown as a strong heroine. The family dynamic is wonderful. With that said I felt like this story wasnt as intriguing as the other stories in the series. Looking forward to Lorenzos story. Fantastic! Love this series and can't wait for the next book!